Buy it now, or bid instantly on anything under the sun. Thanks to Purchase Protection, you can make eligible purchases with peace of mind on both new and used things. So log in, check out, and wait for the doorbell. Make an eBay, credit card payment or pay however you want, without revealing your full financial information using PayPal. Buy, sell, or browse your interests. 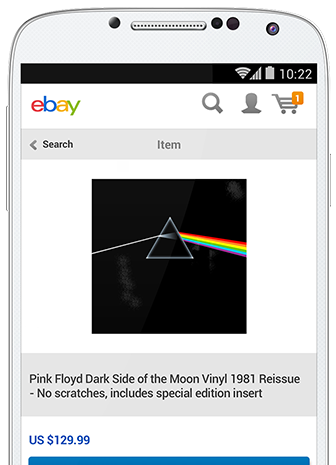 eBay is now the one place to collect all your collections, share them, and scope out others. Buy, sell, or just browse. If you're this good at organizing the internet, your closet should be a breeze. With purchase protection, we've got your back. Shop with peace of mind, your eligible purchase is protected by us. If it doesn’t show up or shows up different than described, we can send you a refund and help wrap things up with the seller. PayPal gives you more eBay payment options. Pay on eBay with any credit card, debit card, bank transfer, your PayPal Cash or PayPal Cash Plus balance, or even apply to get a line of credit. The choice is yours. Simply log in with your email and password and get on with your day. Must have a business PayPal account or PayPal Cash or PayPal Cash Plus account to maintain and use a balance with PayPal. With many currencies to choose from, you can buy from millions of sellers around the world with PayPal as your eBay payment method. We accept 25 currencies from over 200 markets and make all the currency conversions for you for a small fee. Spin that globe. Buying and selling, made simple. The world's largest online marketplace is now open, to you. PayPal's eBay payment options bring buyers and sellers together, reducing steps, costs, and chaos. The only middle man is the mail man.